The Military Postal History Society has started to post interactive web-based mini-presentations that cover very limited aspects of what could be major military postal history subjects. This web system allows you to view a presentation, much like the PowerPoint (tm) system available on Microsoft and Mac computers. However, you can view these presentation slides without any additional software on your computer, phone, or tablet. The idea of these mini-presentations is to provide just a taste of military postal history topics, areas that would normally require a full article or presentation. We want to limit the meat of the article to 5-6 slides. This discipline should help the author focus much more closely on a very narrow aspect of their collecting interest. Please provide the text as plain-text or using a typical word-processor, such as Microsoft Word (tm). Please indicate the text for each slide, by numbering from slide #1. Please review existing Military Postal History Society mini-presentations to see that we've limited each slide to just 3-4 bullet points. Slides containing a lot of dense text are probably better published as complete articles, rather than these small slide shows. Images are displayed as small "thumbnails" on the slides. When the user clicks on an image, a popup window will appear with the larger version of the image. 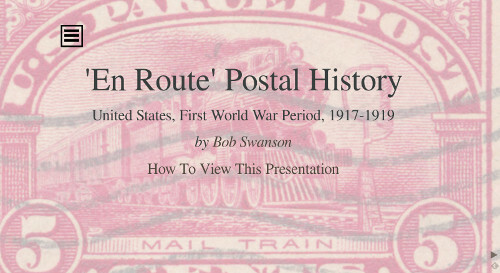 Again, please review existing Military Postal History Society mini-presentations to see how many thumbnail images can appear on a single slide, without becoming too crowded. When you review existing mini-presentations, you will see that some slides have image backgrounds. You can supply images just for backgrounds of the slides. Each slide can actually have its own background image or color. Don't worry about formatting the background image, just supply it, and the webmaster will set it up for display. A background image is usually quite light in color, to allow the text to be clearly read. If in doubt, again the webmaster can modify the image for you.